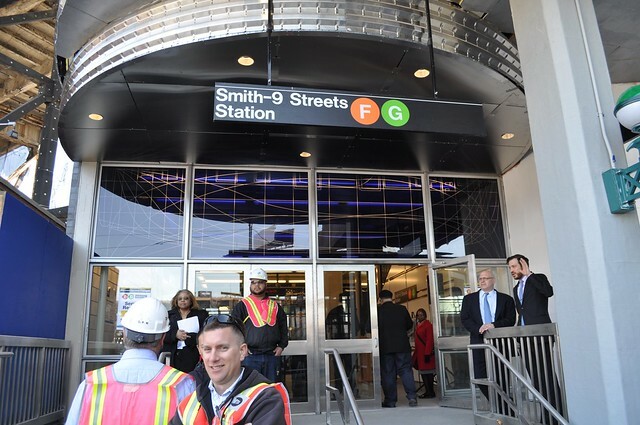 Certainly the highest subway station in New York City (some claim in the world), the Smith-Ninth Street station reopened today after nearly two years of closure for renovations. I happened to be free so I decided to check it out. Some highlights are below. Or you can view the complete set. 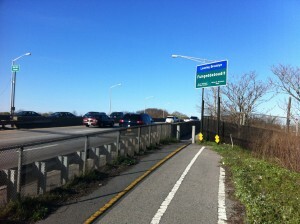 Staten Island isn’t exactly known for its bicycle friendliness. Nevertheless, over the past few years, several bicycling improvements have been made. Much of this has occurred in the northeastern section of the island by its most popular beaches. This area is still on my to-do list. 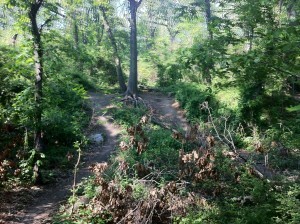 In the southern section of the island is home to Wolfe’s Pond Park, itself home to one of the three New York City mountain biking courses. Seeing that I had recently visiting Cunningham Park in Queens, one of the other two, I thought starting a trip here would be an interesting followup. 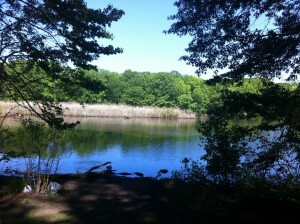 Unless you live on Staten Island, getting to Wolfe’s Pond Park is quite the adventure as well. From northern Brooklyn I ended up taking the East River Ferry to Pier 11 in Lower Manhattan, followed by a relatively quick trip over the Staten Island Ferry terminal. This portion should only take three minutes (it did on my return), but during the daytime when the weather is nice, this can take a few minutes more due to crowding by tourists and other pedestrians. As a bicycle-riding passenger, you get to ride on the bottom level of the ship. Many ferries, including the most modern ones built in recent years, are equipped to transport cars. However, some of these ferries have never even done so as they’ve been banned since 9/11. There is no fee for either you or your bike. With a bicycle on the Manhattan side, you enter the terminal and walk your bike straight through to the former car holding area below the second level (which is only for bike-less passengers). After a police dog has determined your bike safe of anything suspicious, you are asked to wait in a sheltered bike waiting area. 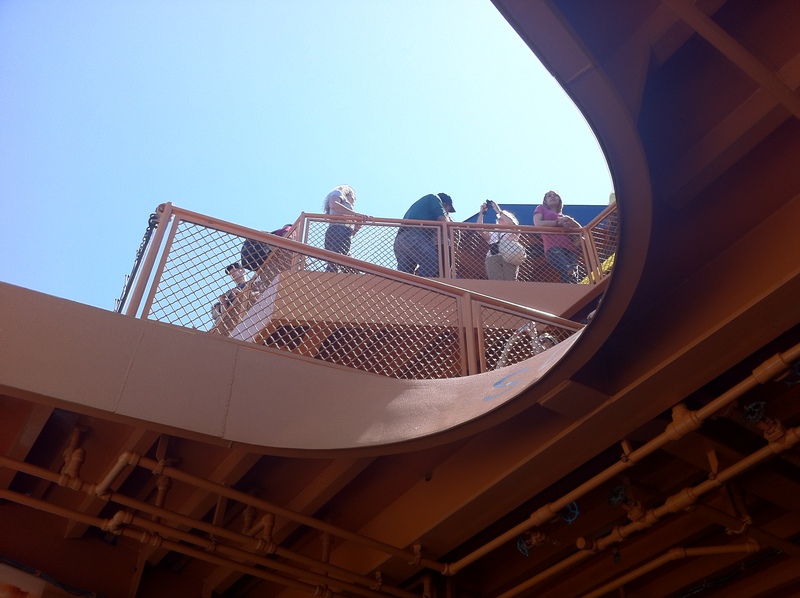 Once all passengers have exited, a ferry worker will yell “bikes!” and you can now board the lowest level of the ferry where you will find some bike racks. In theory, you are now free to do whatever you want during the 25-minute trip, including visiting the other levels, the restrooms, and the snack bar. 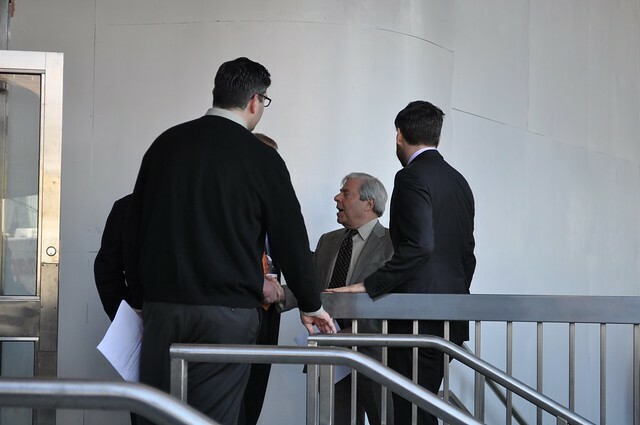 Once arriving on the Staten Island side of the bay, you exit on the lower level of the ferry to former car waiting area of the Staten Island terminal. 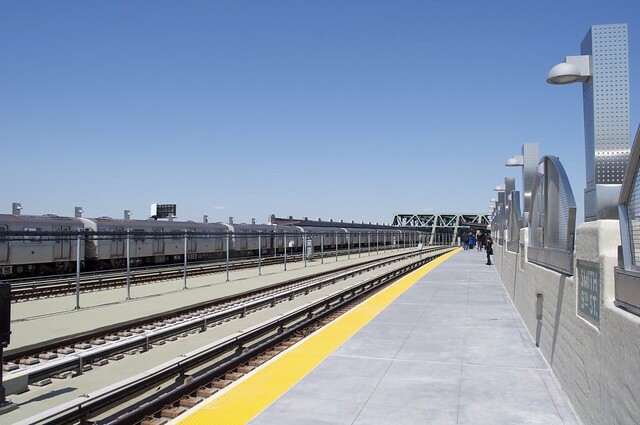 From here, you actually need to enter the terminal via an elevator to get to the Staten Island Railroad (SIR), which will be used for the rest of the journey. Once inside the terminal you follow the signs and eventually descend half a level down to the SIR station. Here, if an agent is present, you can swipe your MetroCard, turn the turnstile with your hand, and they’ll open the gate for you. If there is no agent, well, enjoy lifting your bike over the turnstile. 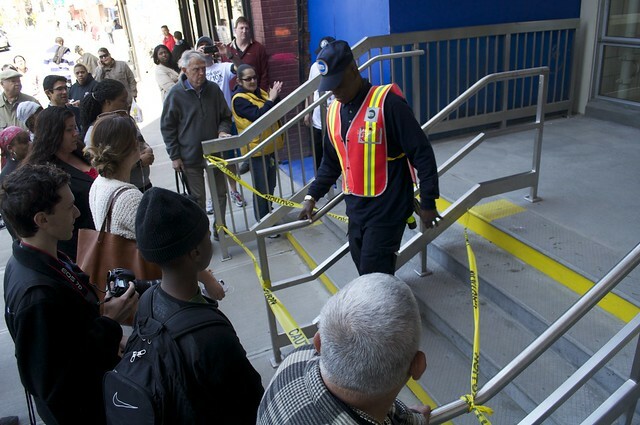 I have reached out to the MTA on what the proper procedure should be in this case. Note that since the SIR only has turnstiles at the northernmost two stations, you’ll have to repeat this on the way back as well. Once you’re on the SIR, the ride is pretty much a 23-minute subway ride to Prince’s Bay station. From here you exit the station, ride one block left, take a left onto the uninhabited Herbert Street, which leads you right into the trails. 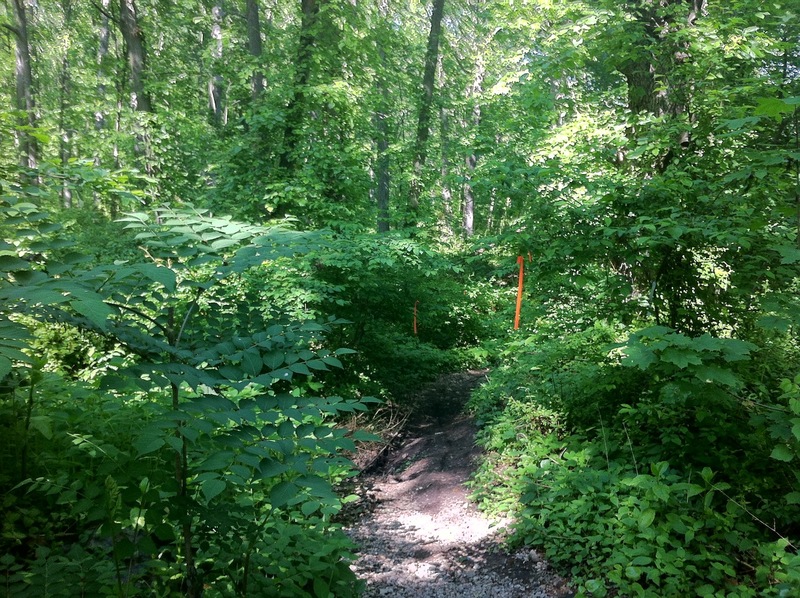 The mountain biking trails in Wolfe’s Pond Park are divided by Hylan Boulevard, and the two sections have a significant riding experience. The northern section is not particularly well marked but has lots of long relatively flat sections. I thought I was following a path when I almost rode into a lake. I couldn’t tell whether the path continued along the lake or not and the immense mud caused me to backtrack and find myself another (or perhaps the intended trail). Aside from this lake mishap, nothing I encountered up in this section was particularly difficult. 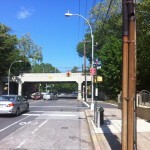 Once reaching Hylan Boulevard, you can cross into the southern section of the park by biking west (to the right when you exit the park) until the next intersection and then crossing the boulevard there. Here you’ll find a small entrance. The southern section of Wolfe’s Pond Park is very clearly marked with pink ribbons hung from the trees and shrubs. The terrain is also much more challenging and you’ll often encounter downed trees in your way, probably leftover from Hurricane Irene. Hurricane Irene also destroyed the park’s major pond, and seeing it devoid of water is rather depressing. It appears that more runners than bicyclists are using this section of the park as I encountered numerous. 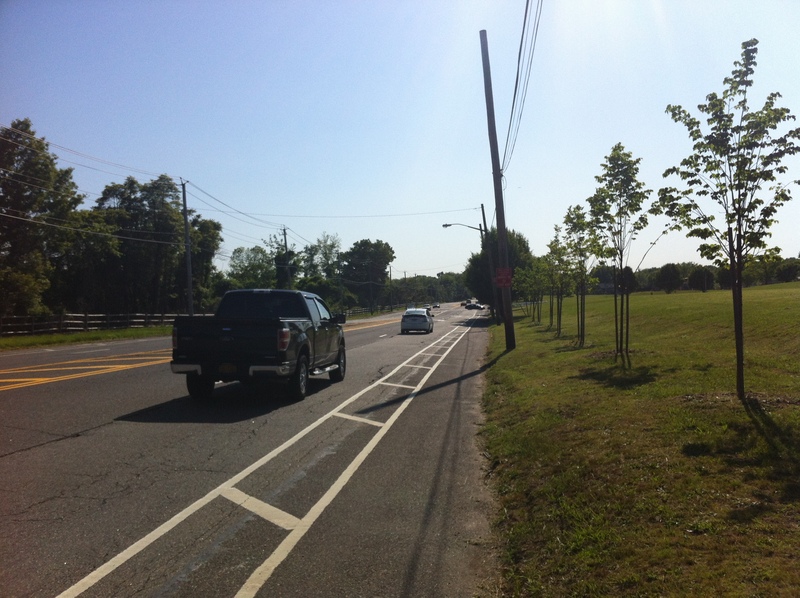 Once you’ve had your fun on the trails, it’s possible to explore Staten Island a bit further by biking south on Hylan Boulevard, which has painted bike lanes. It’s a pretty uneventful segment, save for the Mission of the Immaculate Virgin at Mount Loretto, which has an impressive property. The bike lanes ends at Paige Avenue, where you can take a right and bike down to its intersection at Amboy Road, where you’ll find some shops, including a convenience store, which is great for picking up a refreshment. Amboy Road is not recommended for biking, as its very narrow. Cutting through the parking lot of the strip mall across from the convince store (Tottenville Square), however, you can almost entirely avoid it. Watch for a gap in traffic and zip the 100 feet over to the next intersection, Bethel Avenue. Now you can relax. Welcome to a suburban residential neighborhood. Four blocks in you’ll find Craig Avenue, which will take you into Tottenville proper. At Main Street, you can check out this cute old former village, and then at Bentley Street you ride downhill to the dead end and view the Arthur Kill and New Jersey across it. 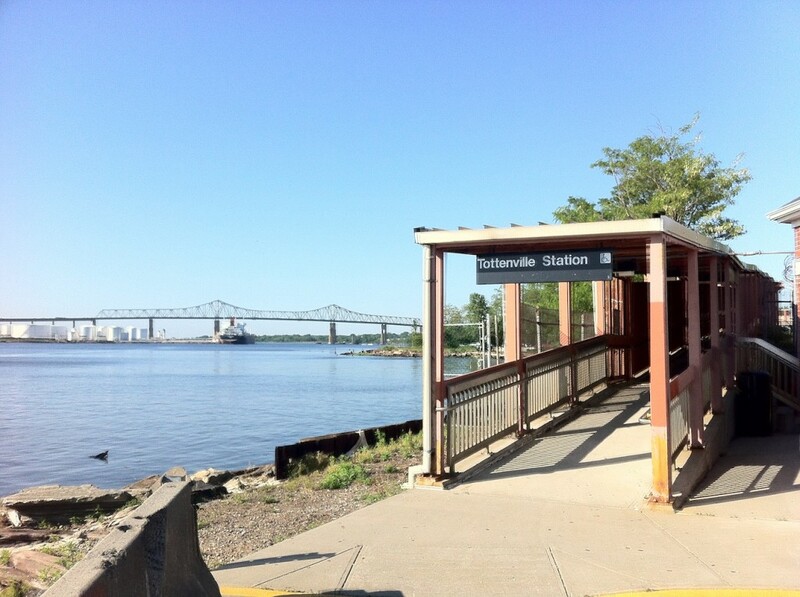 You are now next to the Tottenville SIR station and will find a smooth ramp up to your train back to St. George Ferry Terminal. 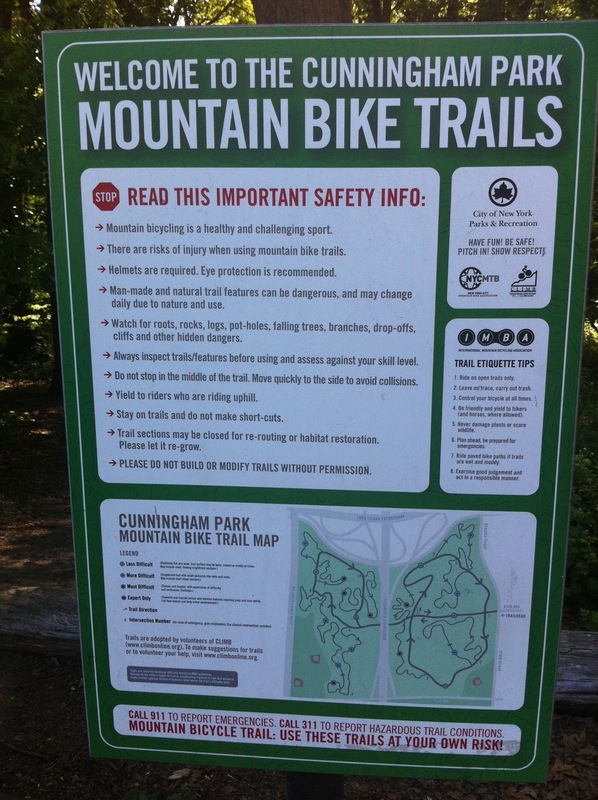 Scanning the NYC Bike Map recently, I came across Cunningham Park in Queens, which has a big blurb on the map regarding mountain biking. I own a mountain bike, but, much like the Jeep owners that never experience much more than a pothole, I had never really taken advantage of the fact that I owned a mountain bike. In fact, I had obtained more road-worthy tires and over the past few months even considered buying more of a road bike. Nevertheless, I thought mountain biking could be fun, so my next task was to figure out how to get there. Cunningham Park is in a far corner of Queens, not far from the Nassau County border, but, thankfully, it’s also not too far from the F-Train’s terminus at 179th Street and Hillside Avenue. Once you exit this huge station closer to the 180th Street side of it (there’s even an elevator), you’ll be facing a large residential boulevard called “Midland Parkway”. 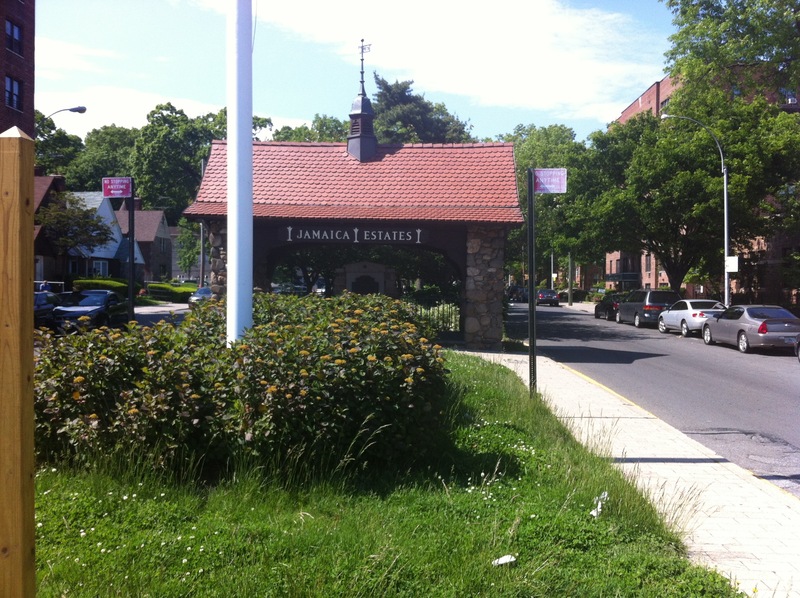 This is the most official-looking entrance to a neighborhood called Jamaica Estates. In fact, Donald Trump grew up on this “parkway”[*]. Midland Parkway doesn’t have a bike lane, but honestly, it doesn’t really need it. It has one very wide lane in each direction and on-street parking that’s barely used. You’ll pass some grand houses including one that even has a sizable waterfall trickling down the front yard. Midland Parkway will take you to 188th Street, which, while not as nice to ride on, didn’t appear to have too much traffic on the Sunday that I tried it out. Taking a left and heading north, you’ll quickly reach 73rd Avenue, which has bike lanes in each direction. I love the streets in Queens. They’re ridiculously wide, often with medians, an indicator they were built with traffic in mind. Taking a right on 73rd Avenue, you’ll soon reach an overpass at 199th Street. This is not a railroad or even an active expressway, but rather the world’s first highway built exclusively for motor vehicles. It opened in 1908 but was already severely outdated soon after and closed in 1938. 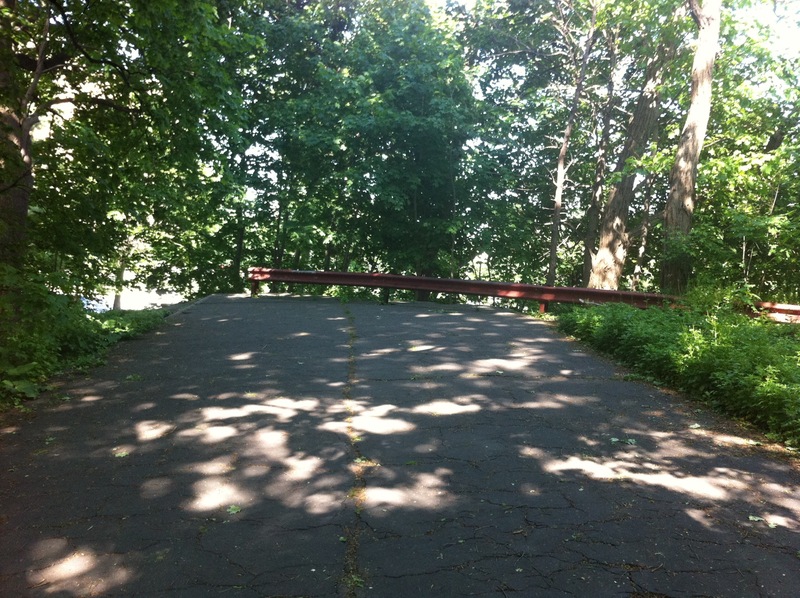 It went by the names Vanderbilt Parkway and Long Island Motor Parkway and stretched from roughly around here to roughly around Ronkonkoma out in the middle of Long Island. All this is relevant because the portion that remains in Queens is essentially a limited-access bikeway (ok, pedestrians are allowed too). You could even call it Queens’ version of Manhattan’s High Line… except with bikes, less landscaping, and forest. You can enter this bikeway half a block south in a patch of Cunningham Park and you can use it to head east towards the mountain bike trail. You’ll head over some overpasses, weave through some sections of woods, and cross under the Clearview Expressway in a tunnel. Then you reach a straightaway that can take you two miles east to Alley Pond Park before abruptly ending at a missing bridge (there is a way out through the park there though). 210th Street is another ridiculously wide residential street that will take you over to the trailhead of the mountain bike run (intersection of 67th Avenue). 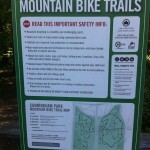 You’ll see a sign for the trails that has all sorts of warnings, rules and etiquette on it. It also has a map. Glance at it and then get going into the woods. 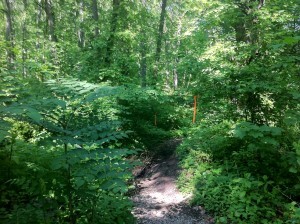 The trails are decently marked, but it’s easy to miss a marker. I had originally intended to do the “less difficult” loop through the park, but sometime after cross the Clearview Expressway I found myself on a “more difficult” trail. At first some of the obstacles seemed a little daunting, but I quickly got used to them. In fact, there weren’t many. The route I took was mostly about winding around trees, climbing small hills, dropping into small valleys and then repeating again. I had some difficulties with some of the steeper hills since the tuning has been off on my bike and I can’t even get into the lowest gears. Overall it was a lot of fun and I was exhausted much quicker than I thought I would. After less than three miles of actual mountain biking (the course has around seven miles), I found myself back at the exit and searching my phone for the nearest deli to obtain some Gatorade. Luckily, there’s a little business district not far away, at the corner of 215th Street and 73rd Avenue. After picking up a Gatorade at a tiny stationary store (there’s also a CVS and a kosher deli), I made my way back to the F-Train. I could have actually stayed on 73rd Avenue (that’s the one with the bike lane, remember? ), but I decided to give that “motor parkway” one more shot and re-accessed it on 210th Street. Around three miles later I found myself back on the subway, exhausted but satisfied. Sometimes there is even bike-specific signage! Bike route – Simple markings on a normal driving lane. These are generally used when adding a full lane would take up too much space. They might put drivers into the mindset that they might encounter bicyclists, and they can help you get back to the nearest full bike lane, but they don’t offer much more than that. Bike lane – A designated lane that motor vehicle drivers are not supposed to drive or park on. This is pretty much ignored, particularly for parking. However, riding in one of these does give you an extra feeling of safety. Some even feature buffer zones between the bike and driving lanes. Protected bike lane (aka Greenway) – A bike lane that’s physically separated from motor vehicle traffic. Often this is done with parked cars or by allowing bikes on extra wide sidewalks. The more you stick to categories two and (particularly) three, the more enjoyable your ride will be. I’m up in Greenpoint, Brooklyn, close to McCarren Park. A couple of blocks over is Leonard Avenue, which has a bike lane. After Broadway, where Leonard ends, there is some signage and pavement markings to direct me over to Tompkins Avenue, which I follow to Dekalb Avenue, which has nice bike lane with buffer area. Due to the street grid in this part of Brooklyn, I actually go quite a bit out of my way to use these bike lanes. Similar to the G-Train it’s a southeast route that shifts to a southwest route to essentially get to a point south of where I started. Dekalb Avenue is easy to ride. It’s rather flat and the traffic isn’t that noticeable. 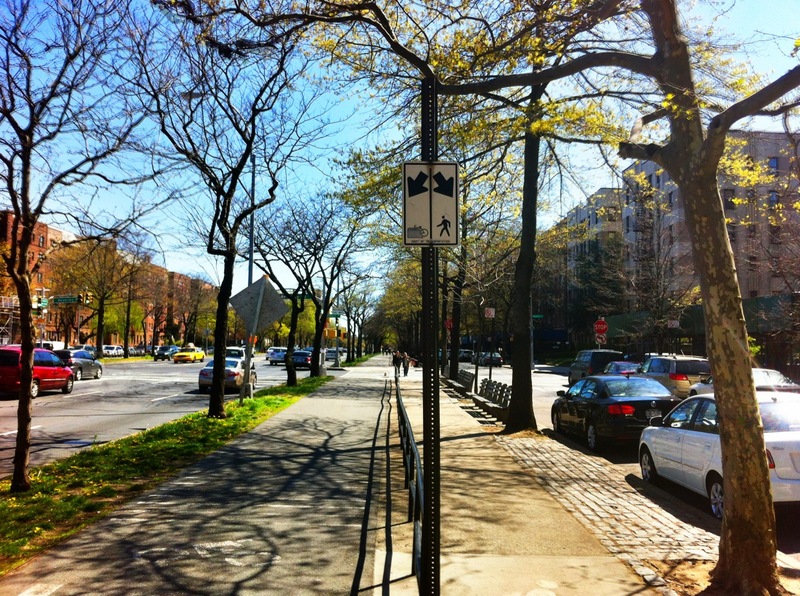 I continue on Dekalb until Vanderbilt Avenue, where I take a left and start heading south. 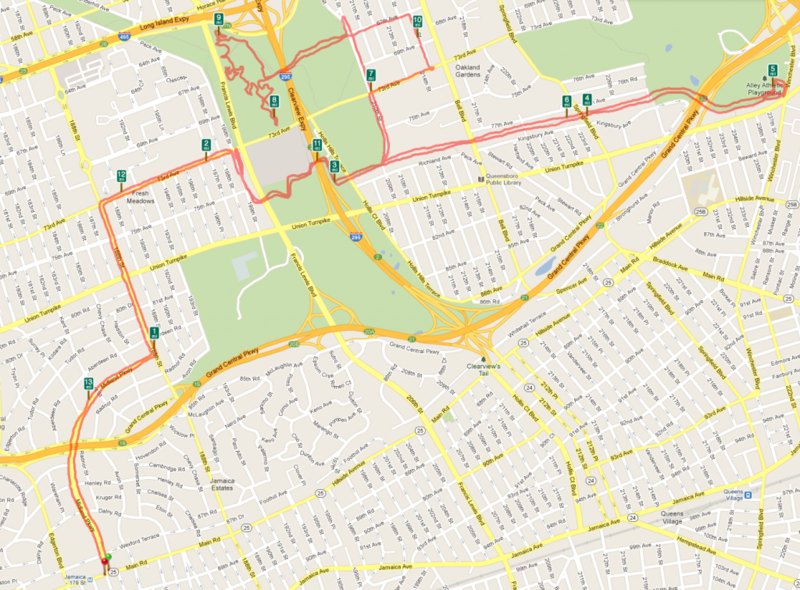 This section of Vanderbilt is only one of those “bike routes” (#1 in the list above), so it’s not as nice to ride on, but this is a short stretch. After Fulton Street a bike lane develops and this takes you all the way up a gradual hill to Grand Army Plaza in front of Prospect Park. The bike lane takes you around the outer circle and guide you into the park. Note that it’s also possible to use a completely separated bike lane along Prospect Park West. But the park is a little bit more fun in my opinion. Heading south in the park, the route is mostly downhill. This is generally the fastest portion of my trip. It’s easy to miss the exit to Machate Circle, which you’ll want to use to get over to Ocean Parkway. The routing here can be a little confusing. You want to cross Prospect Park Southwest and then Ocean Parkway (so essentially diagonally across from where you exit the park). There you’re allowed to ride on the sidewalk. This section is already called Ocean Parkway, which is confusing, since it’s a little street. You’ll ride along a couple of blocks high above the Prospect Expressway until that ends and you’re on Ocean Parkway proper. You need to cross over Ocean Parkway using the Church Avenue intersection to get to the bike path (riding is only allowed on that side). The bike path doesn’t actually officially start until a couple yards south (where the railing begins). The Ocean Parkway ride is pretty nice. The railing separates pedestrians from bicycles, and most people obey this. The only annoyance is that you’re still crossing every intersection and will frequently need to stop. When you do have a green light (technically you’re using the pedestrian light) you still could encounter turning vehicles, however, for some reason, I seldomly see any vehicles doing this, except, notably, at Bay Parkway which diagonally starts out of Ocean Parkway at an intersection that does not have a traffic light. 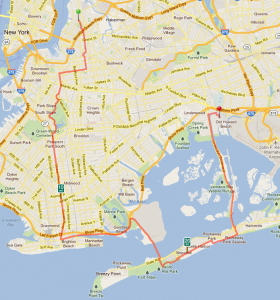 Ocean Parkway will take you all the way down to Coney Island, where you can either stop at the Boardwalk or take a left on Neptune Avenue and continue eastward to Sheepshead Bay. 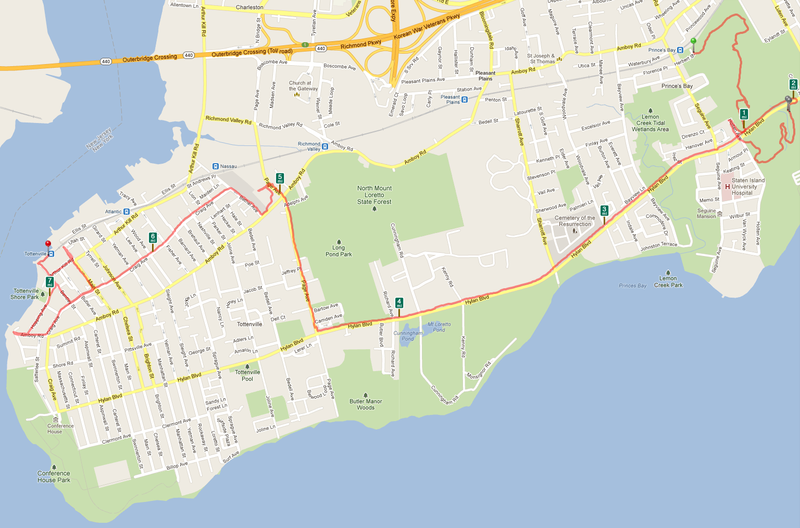 This, once again, is just a bike route and the traffic can be a little annoying. But luckily this section is less than two miles. You pass a fishing marina and the southern end of Bedford Avenue, the longest street in Brooklyn. Right before you get to the Belt Parkway, there is a deli on the opposite side of the street. I have recent begun to use this as it’s the last chance to get some Gatorade or water before your journey outside of civilization. 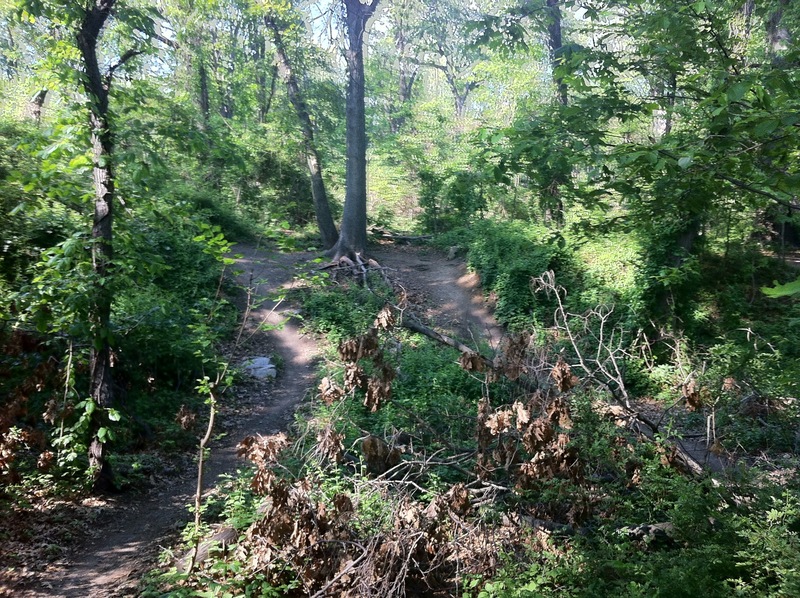 The entrance to the Belt Parkway Greenway is a little hidden. 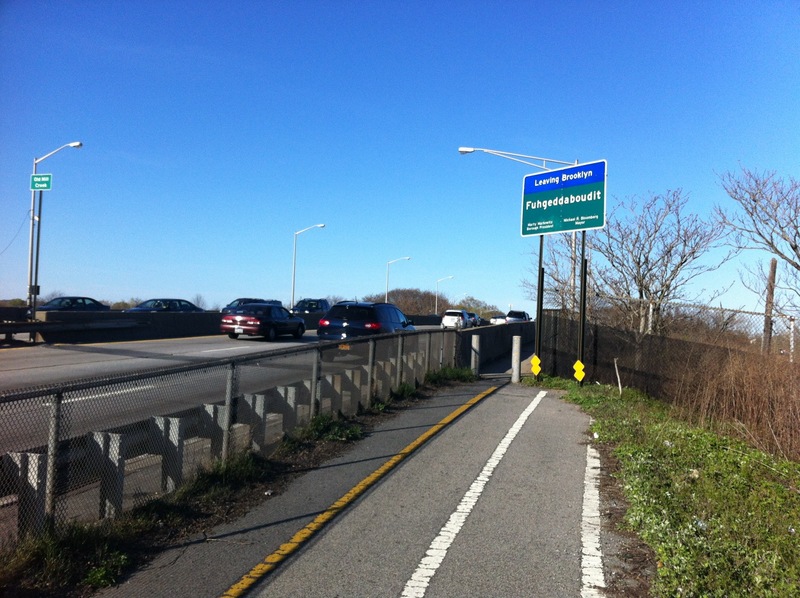 You want to make to not head up the onramp onto the Belt Parkway. Instead, you take a right on Brigham Street and then enter from there. Now you’ve reached easy riding… Oh, well I did forget about the beach erosion. Shortly after you enter the greenway you’ll get to Plumb Beach, which is essentially a highway rest stop (with no facilities) that allows access to small beach (no swimming, too polluted). Shortly before this exit a small section of the beach and the greenway washed away around 2010, so you have to bike on the grass to the left of the path. This is only for maybe 200 feet and then you reach the parking lot and from there you can get back on the greenway. 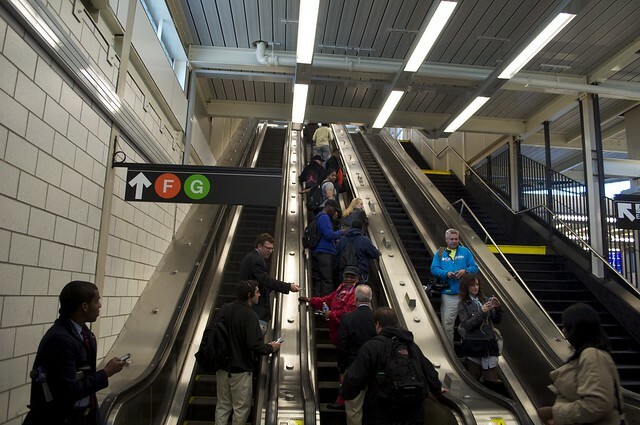 From here you will quickly reach the Flatbush Avenue exit. Here is where you can take a detour via the Rockaways (and add about five miles to your trip) or continue on the Belt Parkway Greenway. 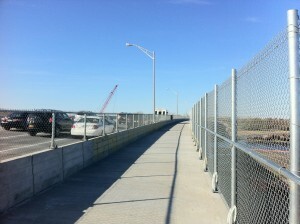 If you continue on the Belt Parkway Greenway, you will pass over a series of bridges. Some have tiny sidewalks that can only realistic be ridden in one direction at a time (so you’ll have to co-ordinate with fellow bicyclists). The newer ones, however, have full width bicycle and pedestrian accommodations. Eventually you’ll reach Queens and can then take a right on 84th Street (the end of the greenway). 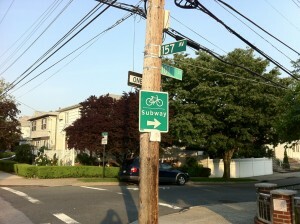 At the next intersection you take a left and then follow the bike bath and signs to the Howard Beach – JFK subway station. The detour to the Rockaways is a little more scenic and I recommend taking it if you have time. You cross the Marine Parkway Bridge and ride through Jacob Riis Beach (bicycling is always allowed on that Boardwalk, presumably since it doesn’t get much use). 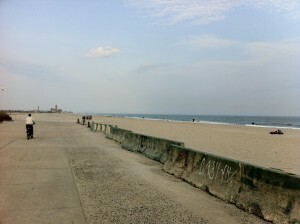 At the end of Jacob Riis Beach you take Rockaway Beach Boulevard for 33 blocks. This is a quiet residential artery street with very generous bike paths. Since you’re on the primary road and there is very little cross traffic and there are very little traffic lights, this section is very enjoyable. 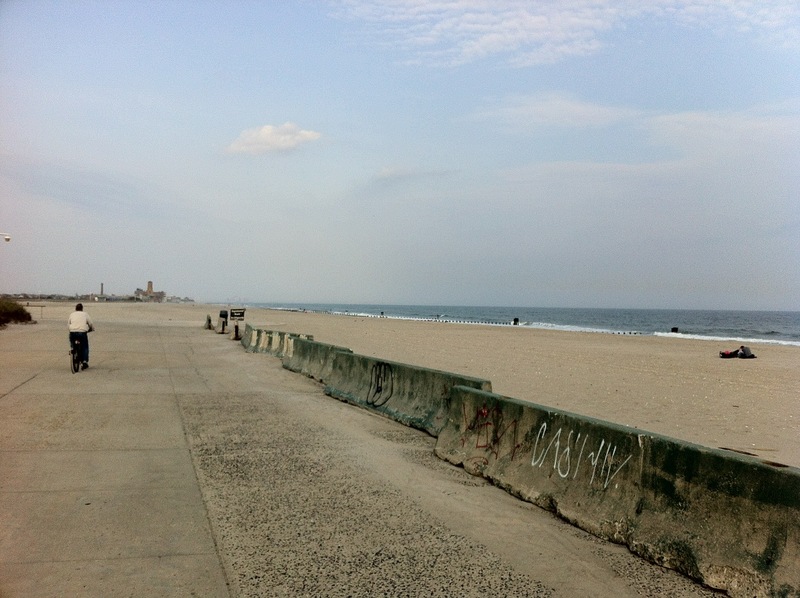 At Beach 116th Street, the main business street in Rockaway Park, I generally take a right and head down to the boardwalk. This is a city boardwalk and it doesn’t allow bike riding after 10am May – September, so during this time it’s advisable to continue on Rockaway Beach Boulevard until Beach 108th Street and then take a right to the Shore Front Parkway, which parallels the boardwalk and has very generous bike lanes. A fun fact is that this was built to be part of an intended actual highway, which luckily never happened. At Beach 94th Street you can take a left and head across the peninsula to the Cross Bay Bridge which will take you over to a nature preserve. For more than three miles this bike path passes through nothingness! It can actually get kind of boring. You eventually cross the Joseph P. Addabbo Memorial Bridge and return to civilization, where you’re actually faced with a mile or so of sharing the road with traffic. There aren’t even bike route markings. Luckily the boulevard is very wide here and you can use the parking lane to avoid much interaction with motorists. 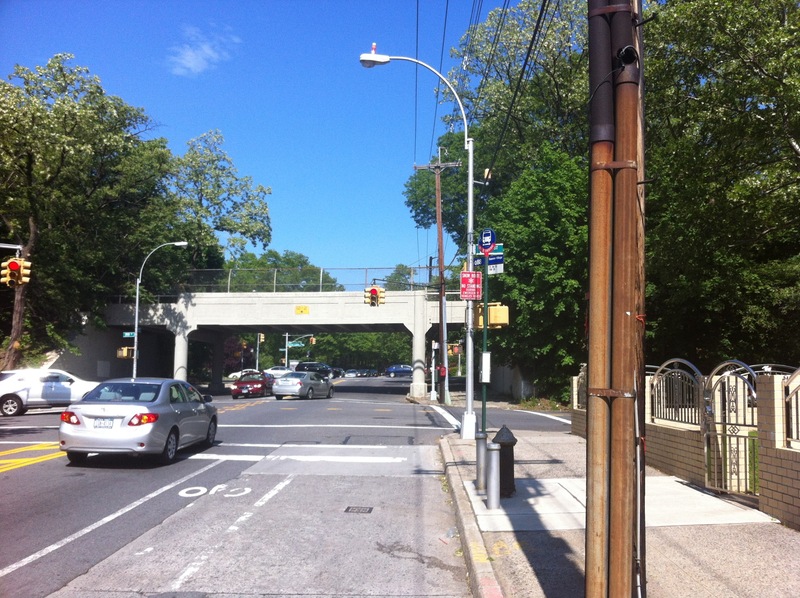 At 157th Avenue, a right turn will guide you on your way to the Howard Beach – JFK station. The Howard Beach – JFK station is a modern station that’s ADA (and bike) accessible. An elevator will take you to the fare control area, where, after turning the turnstile with your hand, the station agent will electronically open the service gate for you. You then take another elevator down to the platform. In the summer it is advisable to go to the front of the platform as the rear cars of the A-train tend to be packed with beachgoers returning from the beach. 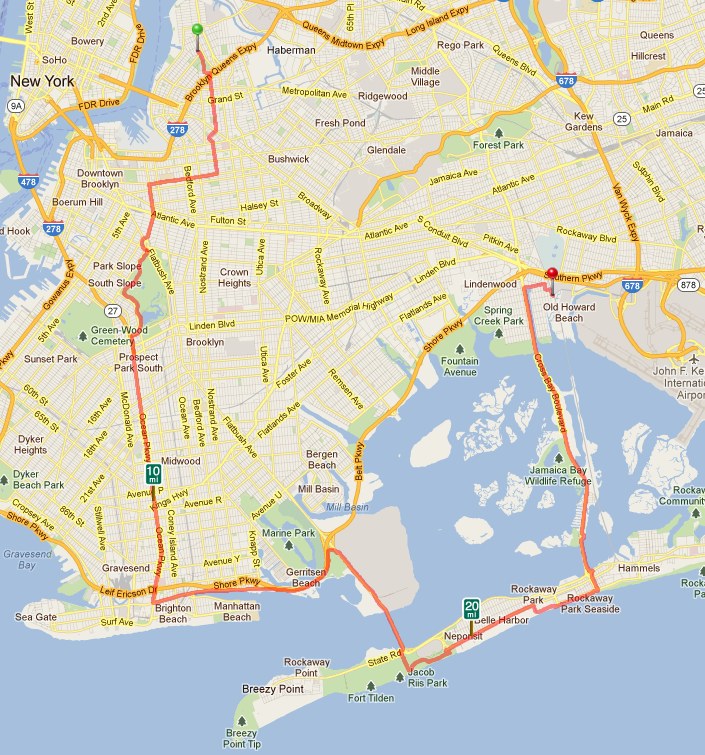 And that’s how you get 25-30 miles of biking in Brooklyn (and Queens) without dealing with too much traffic. 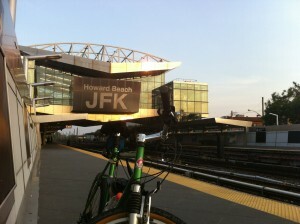 Bike to JFK – May 1, 2011, a set on Flickr. The annual Open House New York happened to be a couple Sundays ago (10/16). Usually I only find a a handful of events that I’m interested in and usually they require a reservation, which I’m always too late for. This year there was one event I was interested in that didn’t require a reservation: The TWA Flight Center Open House at JFK Airport. This building has been closed since 2001, when American bought the struggling TWA. Much of the complex (concourses and gates) was torn down to make room for the new JetBlue Terminal 5, which now sits behind the historic building, also known as the Eero Saarinen Head House. Unlike all other classic JFK terminals such as the Pan Am Worldport and the National Airlines Sundrome, this building has landmark status and will stick around. But there currently isn’t a clear plan on what to do with it. The building’s famous passenger tubes now connect (in an awkward way) to the the JetBlue terminal’s arrival area. Occasionally it is mentioned that this terminal could be used as an optional check-in facility for JetBlue, but that plan seems to have gone nowhere in the three years the new Terminal 5 has been open. Interestingly enough, there are two out-of-service self-check-in machines sitting in the historic building’s lobby. The other plan the has been surfacing as of late is to construct a hotel behind the building. I am no architect, but I fail to see how this would work without destroying the already limited view out of the back of the terminal. I would love to see the building used as an aviation museum, however, the location isn’t exactly the most accessible in the city. TWA Flight Center Open House NYC – 10/16/2011, a set on Flickr. I’m probably approaching 50 lifetime trips to/from Vienna. Amazingly I’ve never experienced any serious travel disturbances. About the worst that has happened so far is that I got into Syracuse at 2:45am instead of 10pm back when I was in college. So maybe I’m due for some travel insanity. I just got on a New York Trailways bus heading to New York City. By the time this gets there around 1:30 a blizzard is supposed to have reached the city. While the Austrian Airlines plane that I plan to take to Vienna is supposed to land at JFK around this time and will probably have no trouble doing so, the challenge is going to be dealing with the four-hours-worth of snow that will fall before the scheduled return trip to Vienna. I plan on getting to the airport around 2:30pm. Hopefully I’ll be able to get out before the snow becomes overwhelming. 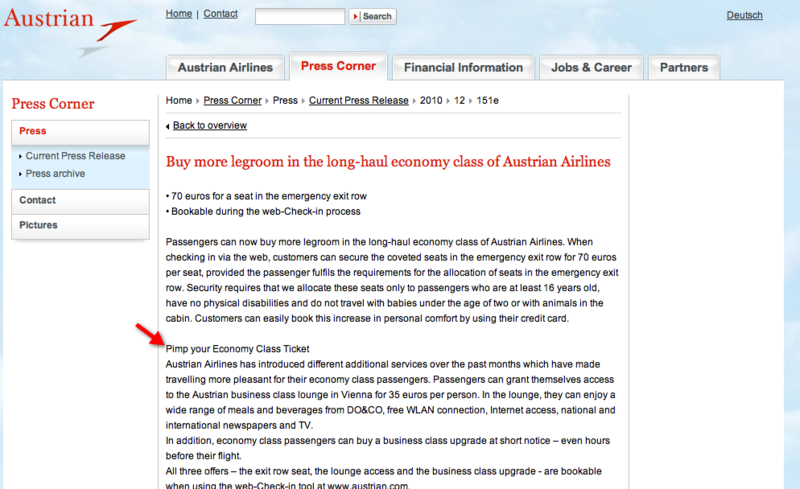 Austrian Airlines' Press Release: "Pimp your Economy Class Ticket"
As my blog turns ten years old next week and I’m flying over to Vienna on Sunday, I thought it might be nice to give a little fodder to my “Lost in Translation” series of posts, where I present some amusing and ridiculous attempts by companies to translate content from German to English. Whether it’s Vienna’s public transportation corporation wishing you a happy new jear or an airport restaurant requesting that you order at the eating version, these little amusements make me smile. With the background on the series out of the way, let’s look at this unique case. This isn’t so much an oversight or bad translation software as it is a cultural phenomena. I remember being in Austria in the summer of 2005 and Pimp My Ride littered the daily MTV Germany schedule morning, noon and night. To make matters worse multiple localized spin-offs were created that “pimped” everything from bikes to doghouses. 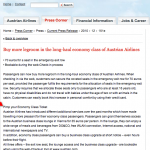 Five years later Austria’s flag carrier, Austrian Airlines, feels it’s perfectly normal to place this phrase in an official press release. I saw a fairly large fire on my way to see the fireworks tonight. 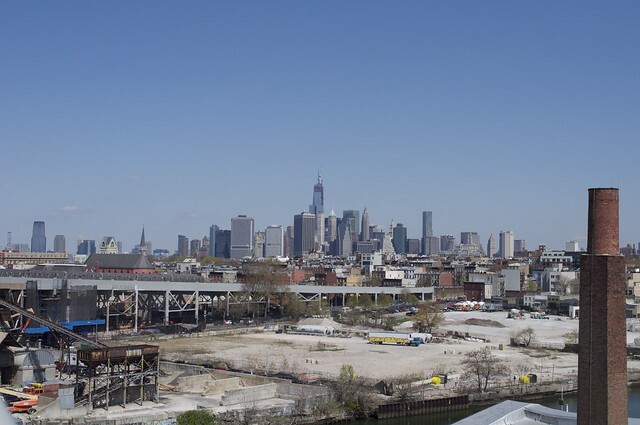 It was in an industrial building at the corner of North 9th Street and Wythe Avenue in Williamsburg. I saw the first smoke around 9:15 while walking on Berry Street along McCarren Park. I quickly walked down to North 10th Street, and that’s when I first saw the flames. I’ve uploaded several more photos after the jump. While the newkai.com domain will be sticking around, I killed the over-eight-year-old “The New Kai” concept of this website. Not only was it horribly out of date content and design-wise, much of it was broken! “The New Kai” concept was based on fifteen-to-eighteen-year-old me and simply had to be discarded of. I now work about fifty hours a week, spend six-plus hours in the gym, enjoy nightlife, and sleep most of the weekend to recuperate from the previous three. It was time for me to upgrade to a much simpler content management system. Any of the worthy content from the old site will be carried over here eventually. You’ll already find a link to my two photo sites in the “pages” section of the main page. Even maintaining a website in this age of Facebook is a struggle. See my post about this last year. I’m finally freeing myself of frames on newkai.com. While they improved the site’s appearance back in the day, there’s no use for them in 2008. And last but not least, there’s no more 18-year-old me frozen all over the screen! There is a Starbucks on virtually every corner and they do not post “restrooms are for customers only” signs. The “Starbucks law” will help you out a lot. However, if you find yourself in a pedestrian-heavy areas, you might find yourself in a ridiculously long line several times longer than the coffee line. That’s where the New York City Public Toilet Map comes in… The preview on the site doesn’t show you too many examples, but it does mention the SoHo Apple Store. I’ve been in there at least a dozen times and never even realized it had a public bathroom. I don’t own this map (yet), but happened to find myself in SoHo on Saturday, when it was packed by European tourists spending the formerly valuable currency known as the dollar. There was a line of about 20 at Starbucks on Spring Street by Lafayette Street. Fortunately I remembered that there’s a Bloomingdales around the corner with three sets of bathrooms. There was no line.